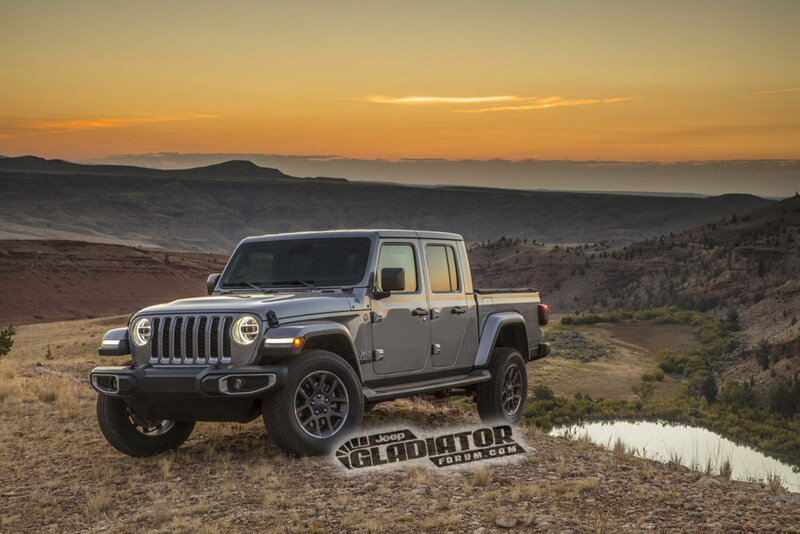 These are the first official photos of the 2020 Jeep Gladiator, the highly anticipated pickup truck version of the Wrangler. 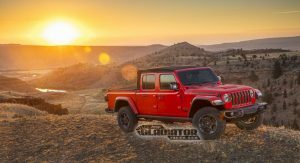 Drawing its name from the 1960’s Jeep Gladiator and the well-received Gladiator concept from 2005, the 2020 production model is being billed as the most capable mid-size truck ever built. The model’s styling largely carries over from the Wrangler, but there are number of unique features aft of the A-pillar. The most notable are the truck’s crew cab and 5 foot (1524 mm) long steel bed which features integrated tie-down points and an external power source. The unique styling is also evident at the rear as the Gladiator has a modified bumper which is available with integrated recovery hooks. The truck also has a unique tailgate, modified taillights and a spare tire that is located underneath the bed. 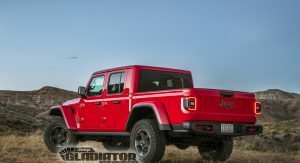 While the Gladiator has a number of unique styling features, Jeep wisely decided to keep the Wrangler’s removable roof. As a result, FCA says the model will be the “only true open-air 4×4 pickup truck” on the market. Engine options carryover from the Wrangler, but the turbocharged 2.0-liter four-cylinder is notably absent. 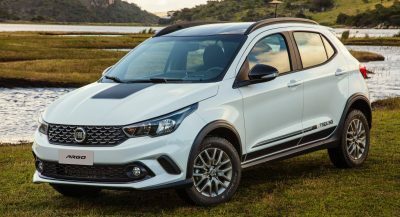 Instead, the model will be launched with a 3.6-liter V6 that should produce 285 hp (212 kW / 289 PS) and 260 lb-ft (352 Nm) of torque. The engine can be connected to either a six-speed manual or an optional eight-speed automatic. 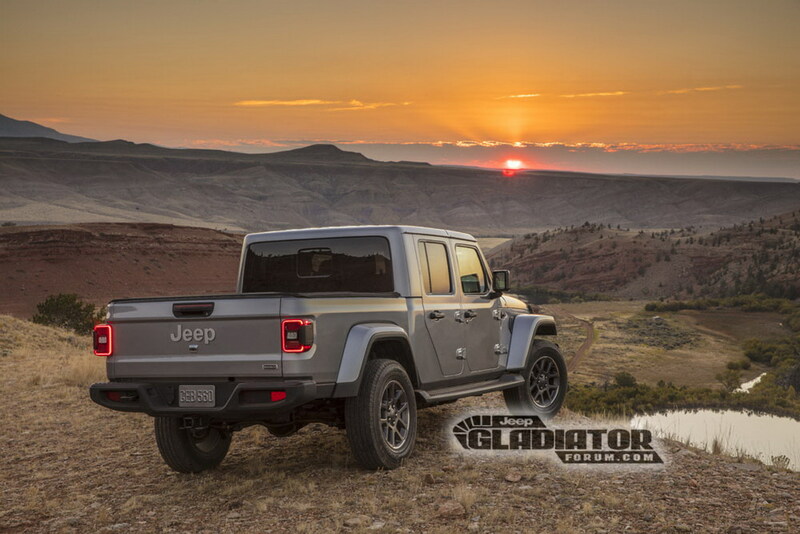 In 2020, the Gladiator will be available with a 3.0-liter EcoDiesel V6 engine that which should have 260 hp (193 kW / 263 PS) and 442 lb-ft (598 Nm) of torque. 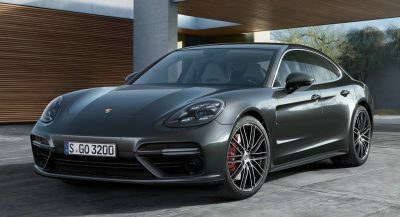 It will be available exclusively with an eight-speed automatic transmission. 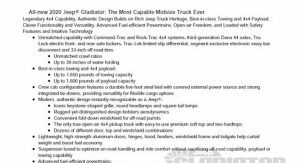 Speaking of capability, the truck will be offered with Command-Trac and Rock-Trac four-wheel drive systems, Dana 44 axles and locking front / rear differentials. Other options include a limited slip differential and 33-inch off-road tires. 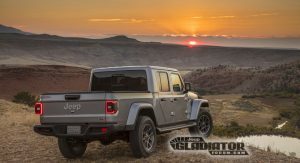 Jeep didn’t mention much about the truck’s suspension, but noted it has been tuned to “optimize on-road handling and ride comfort” without sacrificing off-road capability or towing and payload capacities. 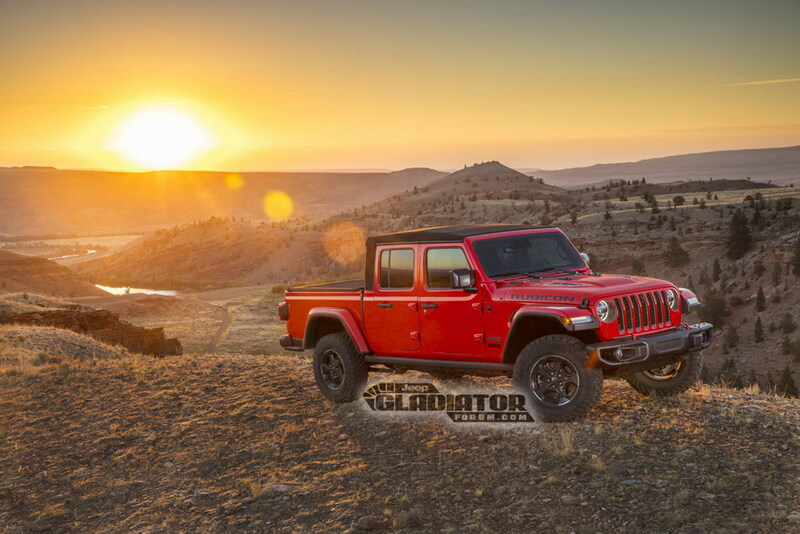 The leaked press release, found by the JeepGladiatorForum, went on to say the Gladiator will have a best-in-class towing capacity of 7,650 lbs (3,470 kg) and a best-in-class payload capacity of 1,600 lbs (725 kg). 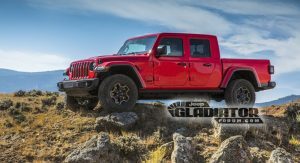 The Jeep Gladiator will make it official debut at the Los Angeles Auto Show on November 28th and sales should begin early next year. This might be nitpicking, but couldn’t they change the rear doors since there is no need for them to angle inward on the bottle. They could, but that would cost a lot of money vs. just using the doors they already have. AND making replacing doors after accidents much much easier. Thought the same – they should extend to the end of the cab – the rear doors seem to be already narrow as it so the kink inwards (like you would find over rear wheel arches) just makes it tighter. Yes they could’ve but it’s saves a lot of money using the same doors as the wrangler. It’s kinda ugly like the Ridgeline, but this is going to print more money for FCA and Jeep. It is kinda ugly isn’t it? I think the bed is too short. two doors would look better on it. right? You know, I think a little bit longer bed would give better proportions to it. But yes, I also think two doors would solve this issue as well. Nevertheless, I think the bed is too small. Welp! There it is… 4 doors. 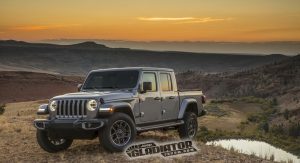 I didn’t realize that they were going to keep the removable roof, plus doors and folding windshield of the standard Wrangler. I wonder what the other available hardtop looks like? This will sell like crazy here in Australia. They’re do very well here in the States. Can you be more specific? Europe is kinda big. Nice truck but nothing earth shattering,maybe it’s the rear section,was expecting more I guess.. I agree, but I’m just glad we have a Jeep pickup truck again. WHO’S been waiting for it? Not working folk, with that tiny bed. Not families, with those tiny rear doors. Single or couple campers would do better with the enclosed space of the 4-door Wrangler. Wah!!! This looks Terrible! Something’s off! I don’t know what it is, but something looks goofy. Some men drove Chevy Luv’s? Well…. on second thought. Never mind. Agreed. Somehow its just kinda ugly. Maybe the proportions are off or something. Picture 6 depicts all what I think is off with the proportions. 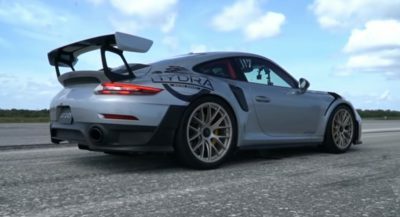 All that flat area, the “connecting lines”, the misaligned arch fender seems a mess to me. I kid you not. I believe the bed is too short. This completely throws the proportions off to the eye. This thing is in a class by itself. I think it’s alright, but it would have been nice for Jeep to do a real pickup not just morph a Wrangler into one again. All they need is a double cab version. It just needs 2 doors and a longer bed. Disappointing. The cab is too long. There should be a 2-door. Why didn’t they use the name Comanche? Most likely because the Comanche was based on an the Cherokee.. They should have also created a extended or single cab variant as well. An extended cab model would be perfect. Reminds me of a Jeep CJ8 Scrambler. That is a short bed. Mark, he’s taking about a trunk. The Wrangler would make a great platform. Best in class towing? Cargo? Nope. In fact it was nothing unpredictable. but it’s still not that nice -you know- I mean I’m a bit disappointed. Perhaps if the rear doors were ‘suicide doors’ it would look better. Any photoshop experts out there?! So… it looks like we expected. I would like to see a single cab version in the future. so a jeep wrangler with a mall truck bed, just what I and I am sure 99% of we all thought it would be.